I heard Philip Yancey at Ada Bible Church, Ada, MI on Saturday night. He spoke on the topic of prayer, the theme of his latest book Prayer: Does It Make Any Difference? Philip opened his talk with some humorous prayers he'd collected and then showed a brief clip from the movie Bruce Almighty where "Bruce" gets a temporary go at being God. Hearing and answering prayers almost did Bruce Almighty (Jim Carrey) in. What delighted me about Yancey was his admission that on a topic as rich and varied and complex as prayer, he goes to Jesus. What do we learn about prayer from Jesus? Jesus prayed. Yancey summarized like this: The reason I pray is because Jesus did. 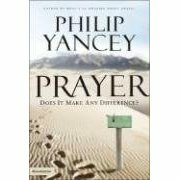 Yancey wrestles with questions like "Why pray if God already knows everything?" and "Does Prayer Make Any Difference?" and "Does God care (about me)?" Philip's closing story about "the presence of God" at work in the South African prison where Nelson Mandella spent his years paints a compelling vision of prayer. I bought a discounted edition of Yancey's book and had him sign it "to Julie." She's reading it and I'm eager to dive into it when she is finished. It was "Sweetest Day" after all. I look forward to reading that book, also. I missed it, though having intended to go. Thanks for the report on it. Philip Yancey is an intriguing person. I like his honesty and simplicity. Sorry to quibble with your quibbling, John, but both of the prayer books you cite were indeed published in the prior century, supporting Yancey's point. Reminder: we're only 5 years into the current century. I was at the Ada Church presentation as well. At the time I was an independent contractor to Zondervan (publisher), providing marketing support. I'd interviewed Philip in the weeks before the book launch and had also attended a private presentation for Zondervan staffers, held in the chapel of what is now Kuyper College. He is an amazing writer, speaker and man. It was a blessing to work with him.